Hugh qualified in 1982 and worked in Equine practice in the UK for nearly 10 years gaining a broad range of experience in several disciplines including; racing, breeding and competition work. During this time, Hugh also gained a certificate in equine stud medicine by examination from the Royal College of Veterinary Surgeons in London. A number of years after returning to Ireland he became a partner in Troytown equine hospital taking a particular interest in Upper Respiratory conditions of the equine athlete, setting up an equine treadmill endoscopic diagnostic facility in 2001 and still uses alongside the on-board endoscopy system. 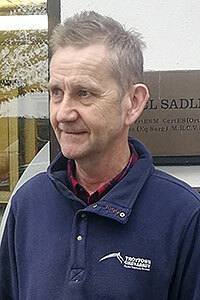 Outside the hospital, Hugh is head vet for a number of high profile thoroughbred studs in the Kildare area.